In large bowl, place onion; cover with boiling water. Soak 6 to 8 minutes or until slightly softened; drain well. In 12-inch skillet, heat oil. Add onions; cook 5 to 8 minutes, stirring frequently, or until crisp-tender. In medium bowl, mix onions, vinegar, salt, oregano, marjoram, thyme, peppercorns and bay leaves. Cover tightly; refrigerate 8 hours or overnight to develop flavors. Remove bay leaves before serving. Meanwhile, carefully cut achiote paste into 1/2-inch pieces with sharp knife; place in blender. Add remaining pork ingredients except bay leaves and pork; blend until smooth. In 13x9-inch (3-quart) glass baking dish, place pork. Rub achiote mixture on pork. Cover; refrigerate 3 hours or overnight. Heat oven to 350°F. Place pork with achiote mixture on center of large sheet of foil; top with 6 bay leaves. Bring up 2 sides of foil so edges meet. Seal edges, making tight 1/2-inch fold; fold again, allowing space for heat circulation and expansion. Fold other sides to seal. Place foil packet in ungreased 13x9-inch pan. Bake about 2 hours 30 minutes or until pork is soft enough to shred. Remove pork from sauce; remove bay leaves. Place sauce in Dutch oven or large bowl. 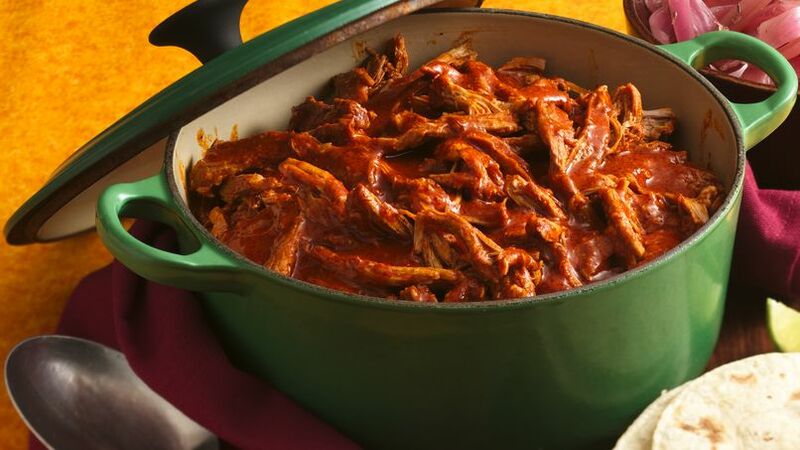 Shred pork; stir into sauce in Dutch oven. To serve, spoon shredded pork mixture onto tortillas; top with pickled onions. Sprinkle with parsley.